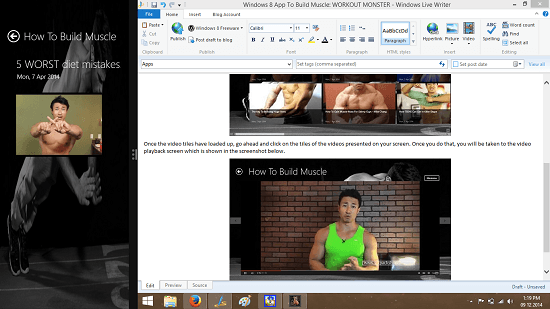 WORKOUT MONSTER is a free Windows 8 app which gives you access to a variety of videos on your device which guide you in the proper way of building muscle. When you launch the app, you will be presented with a tiled layout of all the available videos in the app. When you click on any of the video tiles in the app, the playback of those videos will start almost instantly on your device. The app makes for a great way to attain knowledge and blast the common misconceptions that you might have about working out and building muscle. WORKOUT MONSTER is available for free from the Windows App Store. When you launch the app, you will see a spinning timer which will disappear in a short while. This is the app fetching informational videos from a wide range of sources. When the timer disappears, you will be presented with a large list of horizontally scrollable picture accompanied tiles of videos which you can click on to begin their playback. Once the video tiles have loaded up, go ahead and click on the tiles of the videos presented on your screen. Once you do that, you will be taken to the video playback screen which is shown in the screenshot below. You can use the playback controls at the bottom of the screen to seek the video. The back arrow button at the top left will allow you to go back to the previous screen at any given point of time. The app also supports snapped mode, and you can see the video being played back while snapped in the screenshot attached below. You can hover over the snapped player to reveal the controls. The app does require you to have an active internet connection as it streams the videos from online sources. You can also fire up the control bar of the app if you want and this will house the option to refresh the feed of videos. Once refreshed, you might see some new tiles of videos pop up in the main screen of the app. Quick Tip: To go to the next or the previous video, you can simply click on the arrow buttons on either side of the video player interface, there is no need to return to the main screen of the app for performing that action. WORKOUT MONSTER is a great app to have on your device if you want to get in shape. 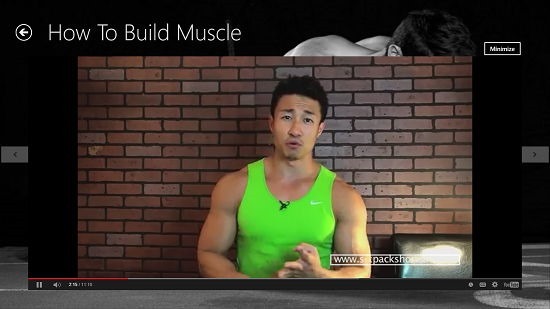 The app has a large number of videos which will help you go a long way if you want to build muscle.